Introducing our new design the ‘Nomad’ friction folder. This knife has evolved through the need for a UK legal carry knife, that is a non- locking knife with a blade under 3″ in length. We wanted to design a friction folder influenced by the classic design of our Woodlander knife with a shapely full sized handle and a blade with a classic Scandi grind so that it could be used for woodcraft and bushcraft. We wanted the knife to fold without compromising on durability, be lightweight, a simple design with the cutting ability of a fixed blade bushcraft knife. The Nomad has a 2.75” blade and a 4.125” handle. The pivot pin is specifically designed for folding knives and is made of hardened stainless steel which can be adjusted with a T9 torx driver to make the blade as tight or as loose as you require. It also has a hardened stainless steel stop pin for extra strength and at the rear a stainless steel pin and aluminum thong tube. Our standard Nomads have handles made from G10 or Micarta in various colour combinations. These handles are textured to make a grippy surface that feels great in the hand even when wet and have a black G10 back spacer as standard. Special editions may have Elm or Birdseye Maple handles. The standard blade is made from 2.5mm unpolished O1 high carbon tool steel, which makes it very easy to maintain. The scandi grind makes it very easy to sharpen ideal for bushcraft and woodcraft duties. 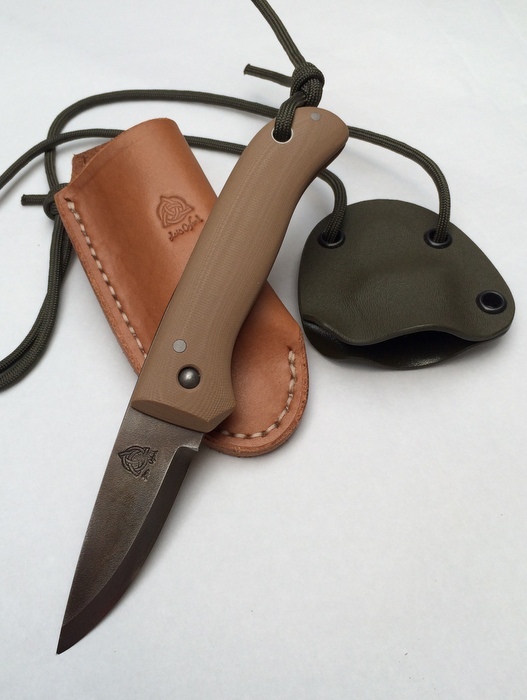 The Nomad comes with the option of either a leather belt sheath or a Kydex neck carry sheath, which can be worn with the knife inverted for easy withdrawal due to the kydex’s locking fit (not available for wooden handled Nomads). *Please note if a kydex sheath is required it needs to be ordered with the knife as each sheath is made to fit each knife individually. OD Green, Coyote Brown, Black & Hunter Orange. Black and Orange, Black and Green, Black and Red, Black and Blue & Multicam.